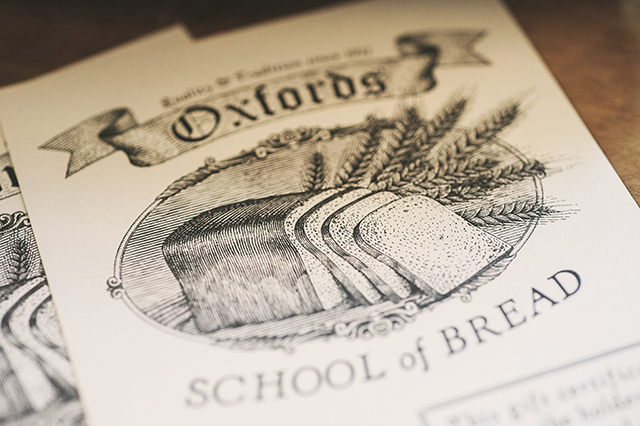 The Dorset-based bakery have been producing bread since 1911, with current owner Steven Oxford still using the same proven recipes and techniques established by his great grandfather over 100 years ago. Steven has made some innovations though, not least being the introduction of his School of Bread – an opportunity to learn some of the key aspects of bread-making and baking in a hands-on environment from Steven and his team. 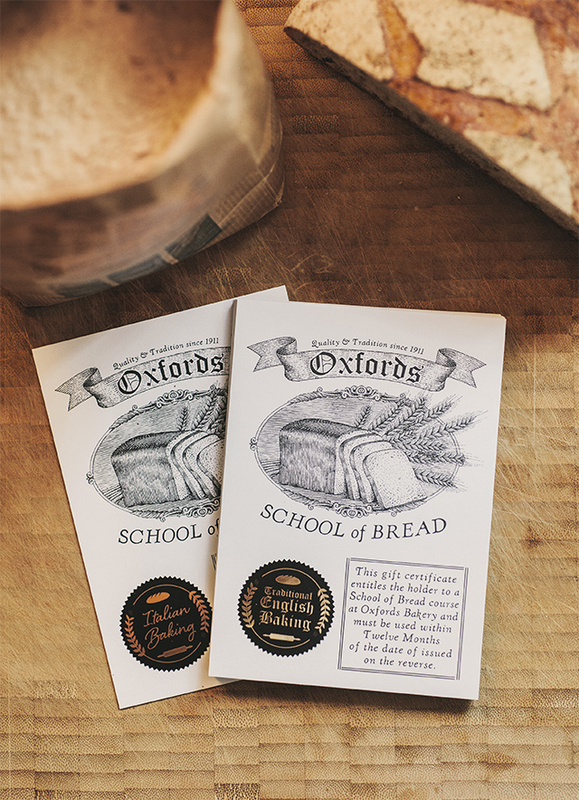 Oxfords were finding that many of their customers were wanting to give these courses as presents, so they needed a great-looking gift certificate producing to sell in their stores. We decided it needed to be a premium printed item that reflected the quality and tradition Oxfords have come to represent. Additionally Steven needed some scope for customising the design, as there are several different classes available within the School of Bread. 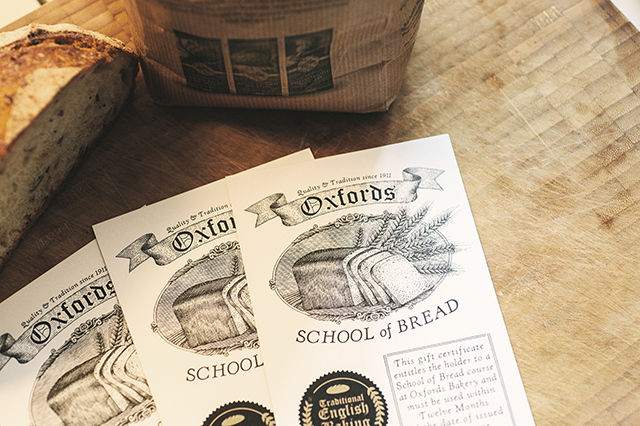 The solution was to design a basic certificate using a high-quality, heavy-stock bonded card. 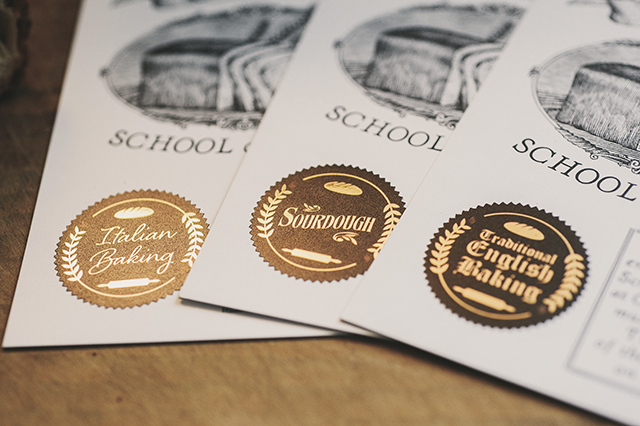 This would then be supplied with a set of gold-metallic stickers with unique designs for each of the three courses, allowing the stores to create their own selection as-and-when needed. In terms of design, I wanted to reflect the print design of the turn of the 20th Century. The fonts of type foundry E-phemera are a great resource for anyone looking to create antique-style text, specialising in reproducing old printed and hand-lettered materials for TV and film props. One in particular caught my eye as rather appropriate: “Shipley” is a worn and weathered face based on “Kennerley”, a typeface produced by Goudy in 1911… the same year Frank Oxford first fired up the oven! This was combined with some scanned engravings dating from the late 1800s to create the final design.